The beauty of the Ford Connect is its versatility. The Short Ford Connect retains the original Ford 60/40 folding seats. The seats fold and tip to maximise luggage area and tilt to optimise passenger comfort. 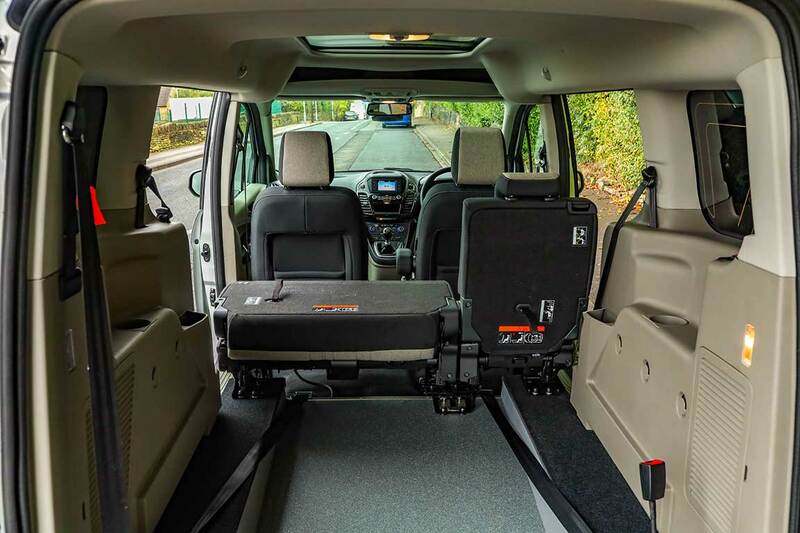 The seats can either be tipped entirely forward to allow space for the wheelchair user behind the driver and passenger or, depending on the size of the wheelchair, one of the rear seats can be retained and the wheelchair user sit just behind. The Long Ford Connect offers even more seating options. Either the original Ford 60/40 folding seats can be retained with the wheelchair user sitting behind, or the 60/40 seat can be removed and replaced with two individual detachable seats which allow the wheelchair user to sit a little further forward in the vehicle. One or two additional tip & fold seats can also be added as a third row where extra seating is required. The original Ford seats and the tip & fold seats come as standard with the added safety of ISOFix mountings. ISOFix can be added to the detachable seats as an optional extra. All the seats we supply are full size seats. Therefore whether the original Ford seats are retained or new seats are added, all passengers are assured of the most comfortable ride.